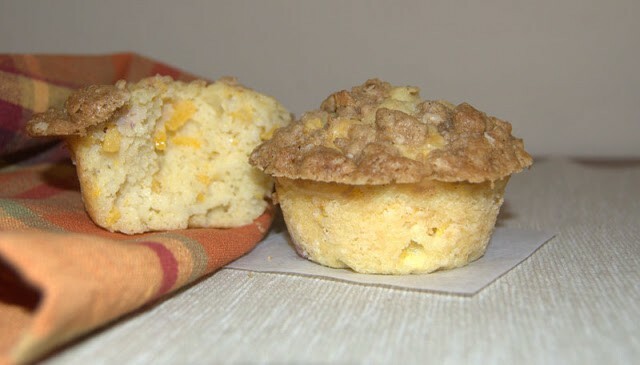 These Peach Streusel Muffins with fresh peaches and a cinnamon streusel topping are a great addition to any summer breakfast. And I’m reposting this recipe so that my viewers have the correct format to print out when I do it later today for my Facebook LIVE video. However, I still need to redo the photos. We’ll do that tomorrow. This post was originally day 201 of my original 365 days, so I figured it was due for an upgrade. I made them one night so that we could eat them for breakfast the next morning, but they were gone within a few hours. Oh, well. Take a look at these other great ideas you can have for breakfast! Since peaches are in abundant supply during the summer we love having this Peaches and Cream Baked French Toast. It’s so easy to put together and is a fabulous breakfast for a Saturday or Sunday morning. These Cinnamon Peach Pancakes are always a hit whenever I make them. Pour some warm maple syrup on them and you’re good to go! Looking for apples? This Caramel Apple French Toast Bake is great not only in the Fall, but all year round! We love to eat it on Christmas morning, too. Looking for something a little more hearty and loaded with flavor? Then these Loaded Huevos Rancheros are for you! Our son has been asking for these every weekend since I first posted them. They ARE just that good! These Peach Streusel Muffins with fresh peaches and cinnamon streusel topping are a great addition to any summer breakfast, ladies brunch or bridal shower! Butter a 6 cup muffin tin or line with muffin cups. You can also use a 12 cup muffin tin and fill the empty cups with water. In a medium bowl, combine flour, baking powder, sugar, and salt. Mix well and set aside. In another medium bowl, beat egg. In a small bowl, toss together the one teaspoon of flour that has been set aside with the diced peach. Pour milk mixture into dry ingredients all at once. Add the diced peach and stir until just moistened. Spoon batter into muffin cups, filling to about two-thirds full. Combine dry ingredients in a small bowl, and using two knives or a pastry cutter, cut in butter until it looks like coarse meal. Transfer tin to a wire rack and allow to cool for 5 minutes. Got muffins on your mind? These Hawaiian Muffins will transport you to the tropics for sure! With that pineapple, banana and coconut..man, I can already imagine I’m swinging in a hammock by a beach enjoying these! Got an abundance of zucchini from your summer garden? Make these delicious Zucchini Chocolate Chip Muffins. These will be great to send the kids off to school with, too! I’m loving these Gingerbread Muffins with Spiced Crumble Topping. I know the house is going to smell incredible while these are baking! Change things up a bit with these Taco Egg Muffin Cups. It’s like a muffins with lots of protein! And if you like breakfast for dinner, serve them up for Taco Tuesdays! I rate everything I bake on a scale of 1-4 with 4 being the absolute best. These Peach Streusel Muffins earned 3 rolling pins. I will definitely be making these again. They had a good flavor and were moist, especially because of the peaches. It was also nice to have a different muffin for a change. For more great breakfast ideas, take a look at these videos! Yay! I had completely forgotten about peach muffins. I haven’t made them in a couple years. I need to see if I still have my beloved recipe. If I don’t, I’ll be back to try yours. Thanks! How delicious! Yes, when it is gone before the post goes up… Its a winner. Your peach streusel muffins were awesome. I made them this morning and a big hit. Thank you for sharing . Patti, thank you so much for letting me know. I’m so very glad you enjoyed them!